ONE of the moons of Jupiter may be another habitable part of the Solar System according to new research showing that Europa is rich in vital minerals and has spectacular water fountains spraying from a subsurface ocean. The Hubble Space Telescope has identified two huge plumes of water as high as 200km (124 miles) which occasionally erupt on Europa, while a separate study has found clay-like minerals littered around the moon's frozen surface. 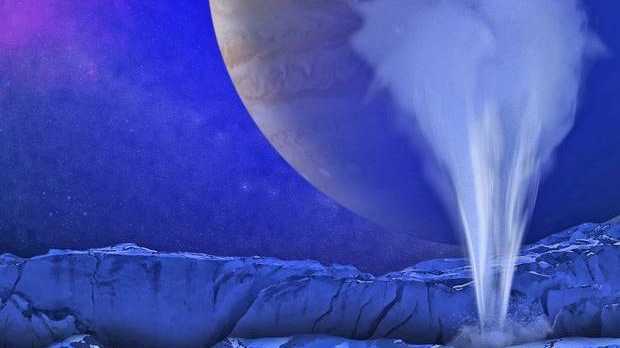 The water fountain appears at certain moments in the orbit of Europa around Jupiter, suggesting it is powered by immense tidal forces that periodically increase the pressure within a subsurface ocean, causing it to erupt through cracks in the surface ice, according an analysis of Hubble data published in the journal Science. Europa is one of the more significant of Jupiter's 63 known moons and astronomers believe that below is ice-covered surface is an ocean kept liquid by the heat of tidal forces. Some scientists have suggested that life may exist within this ocean, living off minerals and using tidal heat as a source of energy.